So it was raining, just like it’s been doing for the last couple of days and it will for the next few. I wish I could be wearing more summery clothing and less layers like I did last week but for now it’s me trying to incorporate spring/summer pieces into more weather appropriate outfits. Today I took on the famous breton sweater. 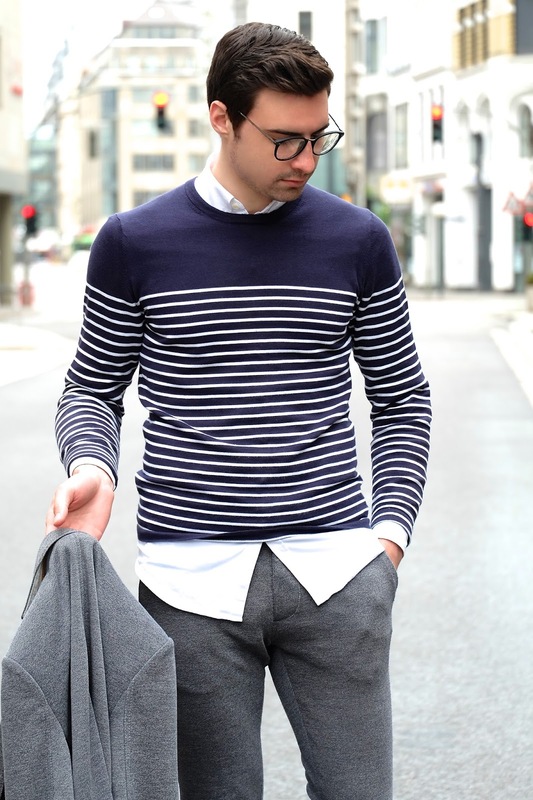 This white and blue striped sweater is pretty much as nautical as you can get. It’s often styled and worn on it’s own with a pair of white jeans or summer chinos and is a go to for summer vacations. Because of the not so summer like weather, I decided to layer it up over a white oxford shirt and wear it with a casual gray suit. Yes, I know this outfit doesn’t exactly scream summer but hopefully I can get back to some warmer weather outfits next week. Thanks as always for reading! This is a really dapper look! I love how you paired it with sneakers and a striped shirt.